Trayvon Martin and Shaima Alawadi: Why the Hesitation to Call Them Hate Crimes? So now we have two tragic stories of a 17-year-old boy in a hoodie and a 17-year-old girl in a hijab. One is gunned down, while the other finds her dying mother brutally attacked at home. And in both cases the police continue to lose the trust of those they are supposed to protect. If the police aren't going to say it, then I am. America, please stop the hate crimes. A hoodie and a hijab. A black teen and a young Iraqi. My hopes that as time goes by, a certain sense of enlightenment has set in with respect to racial profiling and xenophobia. Clearly I'm wrong and continue to be hopelessly naïve. This past week the public outrage on the gunning down of an innocent Florida teen who was just making a Skittles run while watching an NBA game at his father's home in a gated community, dominated social media, cable news, and water cooler conversations. Sanford Police's incompetent handling of this case, solidifies the long running uneasiness that the Florida's African-American community has had with their town's police. George Zimmerman was taken at his word right on the spot, that he was accosted by the young boy the night of February 26th and therefore practicing the state's "Stand Your Ground" law, he shot him in what he claimed to be "self defense." 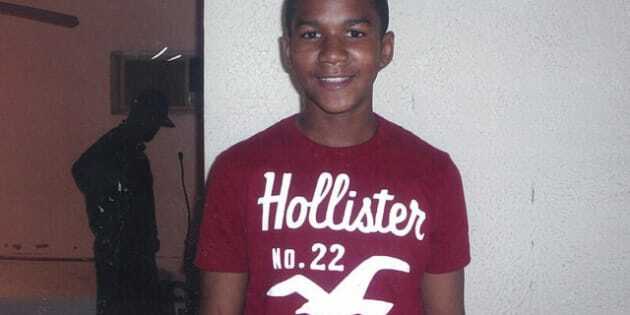 Sanford Police ran drug tests on Martin, but none on Zimmerman, who was free to go home. It wasn't until the 911 calls were released (and not out of the good heartedness of Sanford Police Department, but more due to public pressure), and the statement from the girlfriend that Martin was speaking to, just minutes before his fatal encounter, revealed that there was more to this story. It appears that Zimmerman's self-defense claim seems to be falling apart. And the Sanford Police Department is now scrambling to save face. Keep in mind this happened a month ago. It was headline news in Sanford the next day, and it made the major papers and broadcast cable news throughout Florida. But national (and even global attention) didn't take until news of this tragedy filtered through Facebook and Twitter. Then on March 8th, it went national with CBS news breaking the story. That afternoon it was online at the Huffington Post and days later, the 24-hour cable world got it via CNN. The global newsreel went into overdrive when the 911 calls were released, shedding even more disturbing light on to the tragic chain of events. Zimmerman continues to be free, in hiding and not charged. If this was the other way around...well we'd all know where Trayvon would be right now. Exactly. While hoodies were being donned in national protests across the United States, on Wednesday March 21st, in El Cajon (a suburb of San Diego) California, another 17 year old -- this time a girl -- found her mother brutally attacked and lying unconscious in a pool of blood on their home's dining room floor. Next to her was a note which read, "Go back to your country, you terrorist." Shaima Alawadi, the 32-year-old mother of five children between the ages of 8 and 17, got a similar note just days before, but just like we all do now, she brushed it off as a child's prank. She didn't report it to the authorities. From personal experience, it's all part of the reality of being a Muslim today. Notes like these become so innocuous that it doesn't need much thought nor attention. Sadly, similar to the racial profiling that has become part of the lives of our black brothers and sisters, it happens. We just learn to live with it. Little did Alawadi know that on Wednesday morning, when she said goodbye to her husband and younger kids, whom he was dropping off to school on his way to work, it would only be just a couple of hours later that she would be on the receiving end of near-fatal blows by a tire iron. All in the comfort of her own home. The home that she and her family only lived in for a few weeks, having just moved to San Diego from Michigan. Her husband used to work for the U.S. Army with private contractors serving as cultural advisors for soldiers who are to be deployed to the Middle East. So these "terrorists" were in fact helping the U.S. War on Terror. The doctors had little hope for her survival, and they were right as Shaima was taken off life support this past Saturday. And the police? As per San Diego Police Lieutenant, they are looking at the "possibility" of this being a hate crime and that they "don't want to focus on only one issue and miss something else." Possibility? I'm sorry, but what else is there? So now we have two tragic stories of a 17-year-old boy in a hoodie and a 17-year-old girl in a hijab. One is gunned down, while the other finds her dying mother brutally attacked at home. And in both cases the police continue to lose the trust of those they are supposed to protect. And they wonder why notes similar to what Alawadi received aren't reported? If the police aren't going to say it, then I am. America, please stop the hate crimes. And I know that I'm not being naive here.